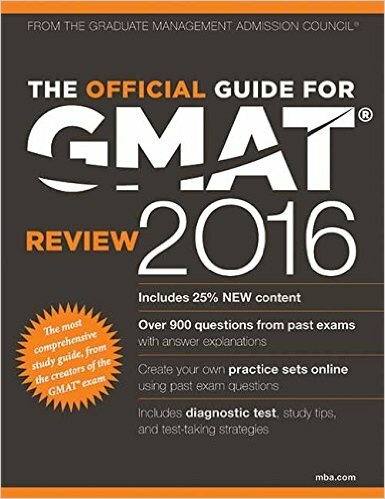 With 25% brand new content, The Official Guide for the GMAT Review 2016 delivers more than 900 retired questions from the official GMAT exam, complete with answer explanations and a 100-question diagnostic exam to help focus your test preparation efforts. What Is the Content of the Test Like? What Computer Skills Will I Need? What Are the Test Centers Like? How Should I Use the Diagnostic Test? Where Can I Get Additional Practice? The Graduate Management Admissions Council (GMAC) is the association of leading graduate business schools around the world. GMAC's mission is to meet the needs of business schools and students through a wide array of products, services, and programs, and the organization serves as a primary resource of research and information about quality graduate management education. GMAC is the owner and administrator of the Graduate Management Admissions Test (GMAT). Created in 1954, the GMAT is the first and only standardized test specifically designed for graduate business and management programs. Available in over 100 countries, it is the global standard for entry to the MBA degree course. Currently about 2,100 schools and 5,900 programs have adopted the GMAT, and the test is taken approximately 230,000 times annually.